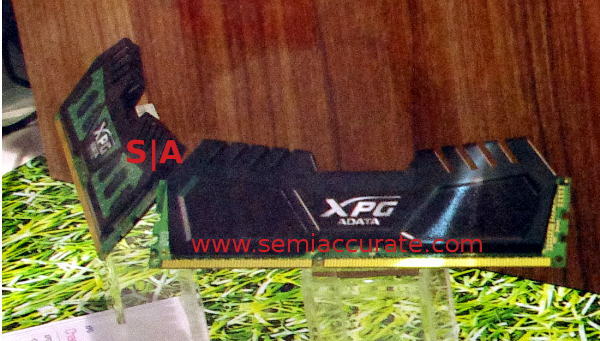 Adata had a bunch of cool things at Computex including some that were based on emerging standards too. As far as storage goes they have most everything you could want, usually in several forms. The first thing that caught my eye was of course Adata’s SX2000, the industry’s first NVMe 2.5″ NVMe SSD we told you about a few days ago. Please note again that Samsung was not the first in this arena. There are some companies that SemiAcccuate has told you about that are shipping NVMe devices and NVMe silicon now but we are not sure if any of them use Adata products. 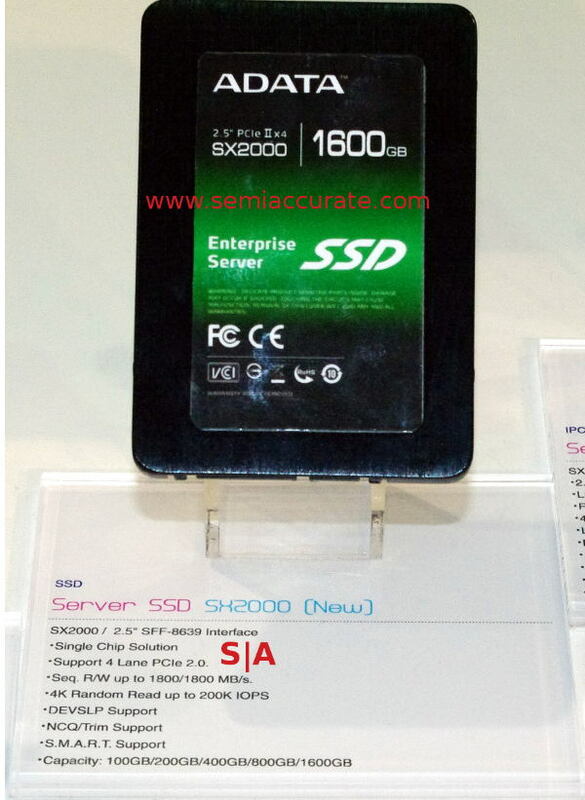 In addition to the SX2000 there was an SX1000 which is a SATA6 version of the same drive. It has a 550/500MBps R/W performance vs the 1800/1800 that NVMe brings, that and the capacity is only from 100-400GB but this actually makes a lot of sense. Why? For the same reason you never see SATA-1.5 4TB HDDs, you will die of old age before it can be written out and read back, or at least die of boredom. Either way another enterprise class SSD is not a bad thing, especially if it is priced more toward Adata’s norm. On the server DRAM side there were three things to talk about the first being a 32GB DDR3/1333 LR-DIMM. Nothing amazingly special here, 1.35V and an unspecified buffer module, but who is to argue cheap and high-capacity. Right next to that was a VLP (Very Low Profile) RDIMM with speeds up to DDR3/1600 and capacities of 2/4//8GB. The best was last with a production ready, production ready looking anyway, DDR4/2133 RDIMM. It has a 1.2V operating voltage and 8GB densities. If you need DDR4 server memory, now you know who to call. Back to the SSD front, the hot topic of the moment is the so called μSSD or BGA pinout single chip SATA SSDs that Sandisk came up with a few years ago. Adata is there with a product cunningly called the micro SSD. It looks just like most of them, a small black square plastic package with 400/180MBps R/W performance and sizes from 16-128GB. This should be more than enough performance for tablets and the like, and if not you can always RAID them.